Each piece of furniture is backed with a 20 year warranty! No maintenance required, just enjoy for life! Gliders are available in all color choices. Choose to glide together or separately at "your own pace". Notice how easily colors coordinate and blend. Single gliders are $691 each if you are in the Magnolia or Conroe areas and would like us to assemble, deliver and set it up on your favorite spot. 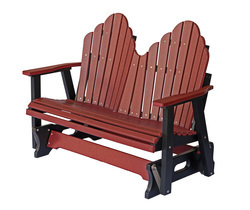 If you are far away or would like to save by assembling it yourself, each glider is $624, we will have it shipped directly to you at no additional charge in all 31 standard color choices; the new Natural Finish colors and custom color combinations are a 10% up-charge $764 assembled or $697 in a box. 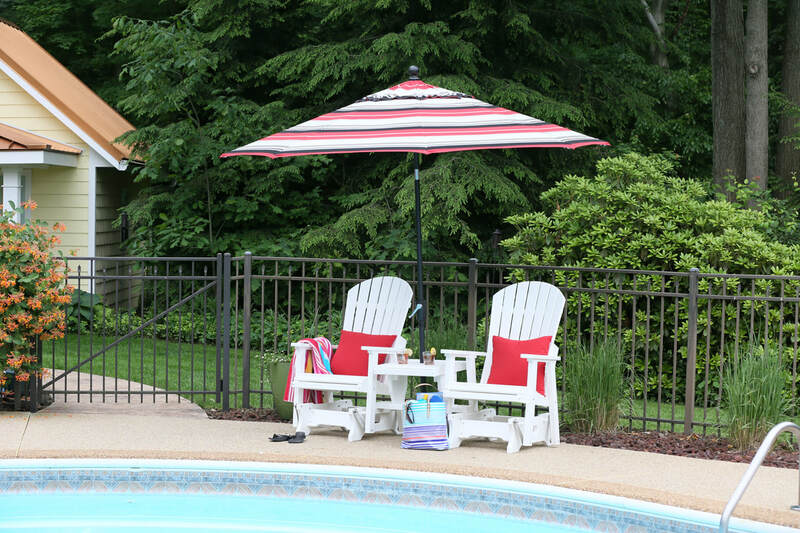 If you live near salt water or are placing your glider next to a swimming pool, we recommend upgrading your glider brackets to the chrome-plated brackets for an additional $63. Cuddle up in a double glider. Shown here in a two-tone of weatherwood on black. Available in all standard color choices and natural finish colors for a 10% up-charge. Double gliders are $1009 if you are in the Magnolia area and would like us to assemble, deliver and set it up on your favorite spot. If you are far away or would like to save a little by assembling it yourself, each double glider is $909, we will have it shipped directly to you at no additional shipping charge. The new Natural finish Double gliders are $1117 if you are in the Magnolia area and would like us to assemble, deliver and set it up on your favorite spot. If you are far away or would like to save a little by assembling it yourself, each double glider is $1017, we will have it shipped directly to you at no additional shipping charge. Settee table option connects two single gliders. Select the same color for the gliders and settee or contrast it with a different color(s). Shown here in white. Notice there are two holes for water bottles, a glass of refreshing ice tea or a canned beverage. There is also an umbrella hole in the top and at the bottom to aid the stability of an umbrella. 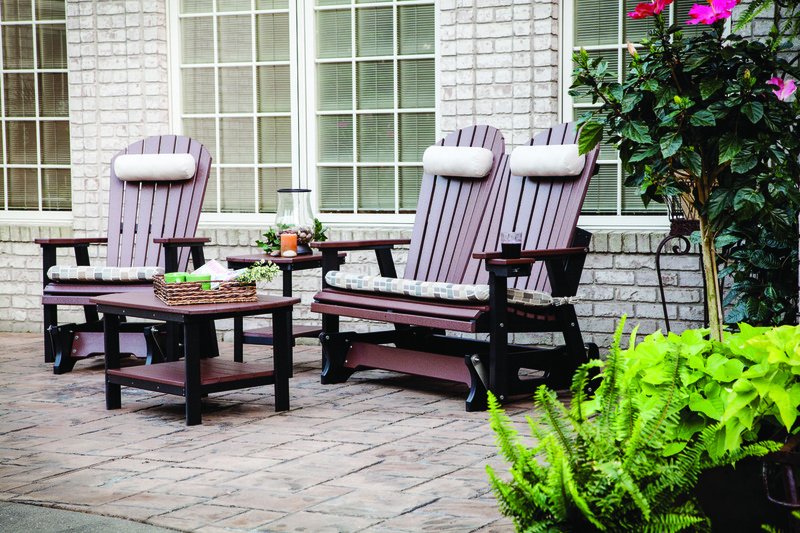 Set as shown with 2 single gliders and 1 gliding settee table assembled, delivered and set up on your property within 30 miles of our stores $1654 or save by assembling it yourself or if you are far away from our area, receive it in boxes $1494 for this set of 2 single gliders and 1 gliding settee table in the regular color or colors of your choice. The natural finish colors are $1829 assembled and delivered in our area or $1669 in a box shipped directly to you. The average time frame from order, to delivery, is 3 weeks. Choose the color or colors you would like your poly furniture to be created in. Choose "regular colors." "two-tone colors," or "tropical colors". UV stabilized so that the color will stay. The color is through and through the poly lumber used to create your life-time outdoor furniture. ​Antique Mahogany, Antique Mahogany On White, Antique Mahogany on Black, Driftwood Gray, Driftwood Gray on White and Driftwood Gray on Black available for most furniture pieces for an additional 10%. Shown above in burgundy on black with the cozi back option. All orders are created upon receipt of payment, check, cash and all major credit cards accepted. The typical time frame from creation to delivery is 3 weeks.